My favorite and most influential professor at Azusa Pacific University, Dr. Dennis Okholm has recently produced a new book about which I'm so excited I'm even telling you about it on my blog. 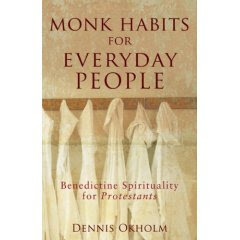 He's written and edited a few other books (including A Family of faith: An Introduction to Evangelical Christianity, Four views on Salvation in a Pluralistic world and others) but this book, Monk Habits, is the first he's written solo. Dr. Okholm is a Princeton grad theologian and Benedictine Oblate with an inspirational perspective on Biblical theology and Christian practice and an enlightened understanding of the Church and culture. He's had a huge influence on me in my education at APU. Put this book on your list now so you can read it the day it comes out (December 1, 2007).